Ive been having quite a bit of satisfaction viewing water samples with my brand new microscope. I have viewed both fresh water and sea water though so far, I have not found any organisms / moving critters. The only organic things that Ive come across appear to be bits of vegetation (which are still great to look at.) Is it pure luck when you come across organisms? Or are there some techniques involved? Unfortunately, there are no ponds around here and being summer, a lot of the fresh water habitats have dried up. I was surprised that I didn't see any creatures in the sea water samples I collected. I was expecting to see at least some zooplankton. So I see it's best to collect plant samples along with the water. What I was doing was scooping up water through the plants (within the natural habitat) but leaving the plants behind. Ive also heard about leaving a jar of water and hay sitting on a window sill for a few days. Though should the lid be on or off? Keep the lid off, as some protists need oxygen. Natural environment has oxygen supply, by putting the lid on, you remove oxygen supply. Get plant sample and bottom mud sample. Squeeze out water from both samples, let precipitate, then examine that precipitation. It would be messy, but you should see many protists, even from frozen samples. Thanks for the tips. I went on a walk through the woods today in the hills and came across a rocky embankment with two holes in it. One of these holes has a substantial amount of rain water stored in it (about a quarter full.) That's really impressive because it's a really warm summer at the moment and most other fresh water bodies around here have dried up. There's also a lot of vegetation in there as well. I bet it would be full of microscopic organisms. I didn't have a container with me but I'll go back there and see if I can find it again. Ive refined my technique and have since gotten better results by collecting vegetation as well as water. I took a water sample from a creek that was close to drying out. Water looked like it was in poor condition and I took some mud from the bottom of the creek as well. I also added wild grass and let it all sit in an open jar for a few days. I made two slides from the creek water and found a few different critters. Pretty much all of them were transparent to varying degrees. There were these very slow moving tube things with yellow in the middle with dots. And what looked like a Paramecium but I'm not 100% sure. It was less oval shaped compared to images of Paramecium that I see online. Regardless, it was very active. I could just barely make out the cilia moving around the edge of it's body. There were also these things that were shaped like cucumbers. Most of the time, they'd move through the water very slowly but occasionally sped up. The Paramecium was moving all over the place and would occasionally bump into the cucumber-shaped things. One time, the impact was quite considerable and one of the cucumber-shaped things was knocked quite violently. A few days later, I collected some desalinated water from the bird bath in the backyard. I came across a number of Rotifers in this water. At one stage, there were about four of them together (viewing with the 40x objective.) I could see the cilia around their mouths moving and occasionally they would draw in quite large particles into their bodies. Sometimes they would anchor themselves to bits of vegetation and other times they would freely swim around. I'm still keen to see some marine zooplankton. There's a beach nearby so I'll grab some vegetation from the sea water and see if I have any success with that. As noted in my previous post, Ive now had a fair amount of success finding organisms in fresh water samples. Though for some strange reason, I still cannot find any life forms in sea water. I take my samples directly from pieces of vegetation, just as I do with fresh water. I keep hearing about all the huge amount of zooplankton that resides in our oceans but so far, I cannot find any. More recently, Ive heard that there are micro organisms that live among sand grains at the beach. So I took a sand sample close to shore at my local beach but yet again, there are no critters to be seen. I get similar results where I am, the sea water appears to have very little zooplankton in it. I usually get a good pile of diatoms in the fine algae, and the algae itself of course but not very much else. Guess we're just unlucky. Sounds like you're having more success than me if you're finding diatoms. I can't even find those in my seawater samples! This lack of zooplankton is very puzzling. I was under the impression that this stuff was at the bottom of the food chain in our oceans. If there are fish and other large creatures around, I would have thought there would have to be a decent amount of zooplankton present to support these animals. If you have easy access to a salt water area you should be able to find plenty of things worth looking at through a microscope. 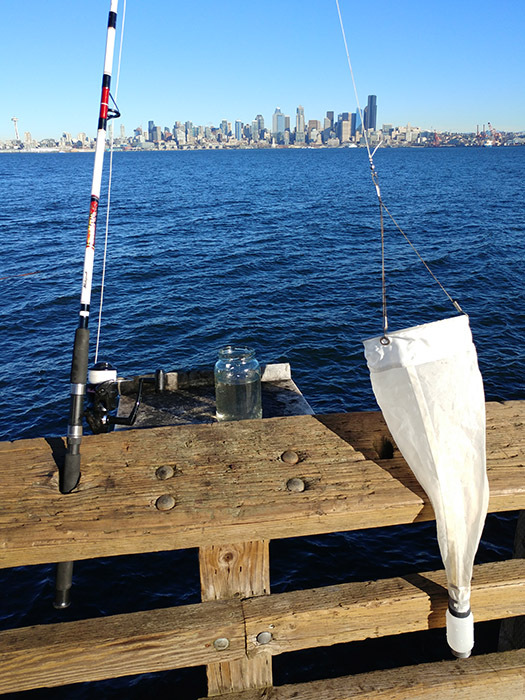 For "free-floating" plankton you should consider a small plankton net. Larger high end ones can get quite expensive, but small ones (5-8 inches top ring) can readily be used to collect specimens from shore. Some useful manufactured ones are available in the $80-$150 range. If you are even a bit handy there are quite a few DIY postings on the internet (just google "DIY plankton net"). I use mine attached to a cheap but strong fishing pole. I'll cast it out from shore, or walk it along along a fishing pier or boat dock. If you buy a commercial one choose a mesh size between about 80µ and 153µ. Your "catch" can vary greatly at different times of the year, and even different times of the day. Even without a net you can find great subjects. Pay attention to the tides. When there is a good "minus" tide head out and collect off of pilings and in small "pools" in rocks. Scrape the surfaces into containers. Keep an eye out for brown colored "slime", or what appears to be very fine brown alga... often this will be diatoms. Keep in mind that salt water collections will generally have a much shorter "shelf life" than fresh water samples. (If it is a hot summer day place it in a cooler ASAP). It's a good idea to have your microscope and whatever else you need in your "lab" ready to go when you return from collecting. Thanks for the tips for collecting in seawater. Those nets sound quite pricey. Might look into the DIY ones. I'll explore some tidal pools today. By the way, it seems that my fresh water sampling is not successful these days. A lot of the fresh water bodies around here have dried up. Ive filled a jar full of spring water and put in grass, leaves and dirt from a dry creek bed and left it for over a week. Ive viewed two samples from that water under my scope and found no organisms at all. When there was a bit of water left in the creek, I collected some of that and kept it in a jar and every time I took a sample, I found creatures. Don't suppose there's something wrong with my spring water? I assume spring water can't be treated like tap water? There were periods of time when the jar was in full sun but so was the jar full of creek water and that didn't have any adverse effect. Ive just had another look at a sample from the spring water in the jar. I saw something interesting that was green and had a fair bit of detail. Looked like it could possibly be some vegetation. I had a closer look at it with the 40x objective. It was only then that I noticed some extremely tiny little critters that looked like blobs swimming around nearby. They were only visible with 400x magnification. So it seems that there is some life in this water after all - but on an extremely small scale. I will take another sample from this water but this time, I'll position the pipette at the bottom of the jar where the dirt collected from the dry creek bed is. If that's not productive, I'll explore some tidal pools among the rocks near the beach.